Steiff animal: Squirell original Steiff markings and buttom in ear. 50-ties. Cute Steiff Boxer. Mohair Glass eyes. Blue collar. Ca 1950. Mint condition. 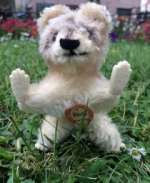 H. 12 cm /5"
Cute Steiff Squirell with all the original Steiff markings and buttom in ear. Glass eyes. Ca 1950. Mint condition. 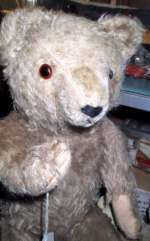 H. 12 cm /5"
Steiff animal: Racoon original Steiff markings and buttom in ear. 50-ties. Cute Steiff Racoon with all the original Steiff markings and buttom in ear. Glass eyes. Ca 1950. Mint condition. H. 12 cm /5"
Steiff Hund: Pekinese "Peky". Mohair, light brown. Head to move.. 16 cm. Excellent condition. 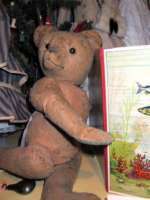 Early lovely Teddy bear. I think he isfrom ca 1920. Good condition. Button eyes. Size 45 cm. Ask for more photos! Stor lys bamse med mange år på bagen.